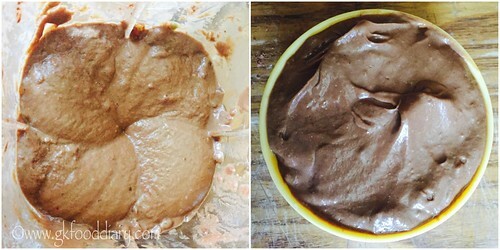 Chocolate avocado pudding – light smooth chocolate pudding recipe with avocados and bananas, Tasty dessert for kids.I have made this chocolate pudding more healthy and thick without eggs by adding chia seeds to the recipe. Read more on the health benefits of chia seeds and how to include the same to your kids diet here. 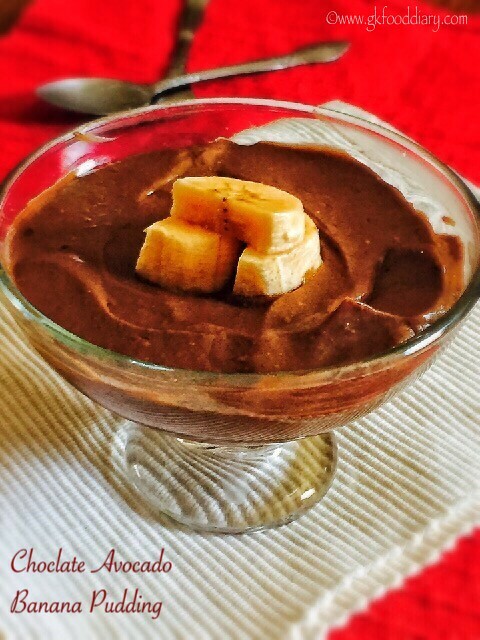 If your kid don’t like the taste of avocados, then you should try this chocolate pudding! 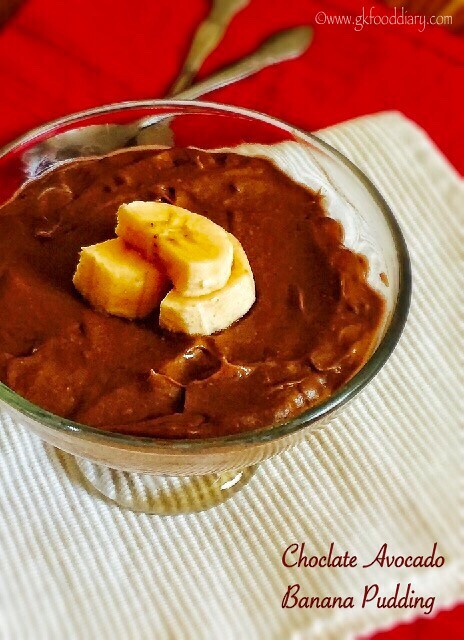 This chocolate avocado pudding recipe is ideal for kids from 2 years. Do give this chocolate pudding a try and give me your comments! 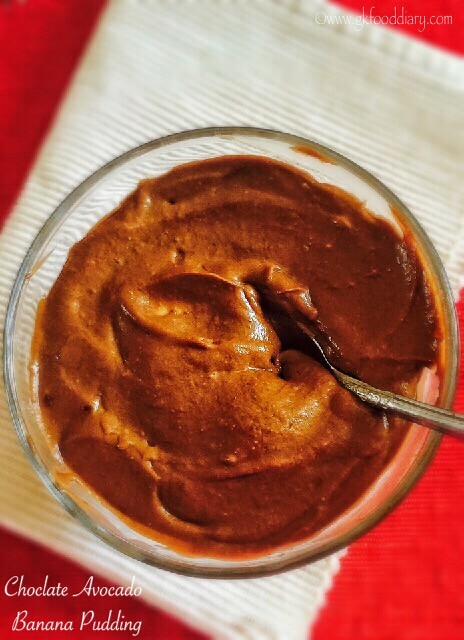 Here is how to make chocolate avocado pudding recipe for toddlers and kids. Soak 1 tbsp of chia seeds in water overnight. Next day, it turned out like gel. Use this to your pudding. Measure and keep all ingredients ready. Wash the avocados in running water thoroughly. Peel and scoop the avocados. Also Peel and slice the bananas. Then take the scooped avocados and sliced bananas into a blender along with other ingredients. Blend everything till smooth. Add the required amount of water as mentioned while grinding. Pour it in serving bowl and refrigerate for at least 30 minutes. 1. Soak 1 tbsp of chia seeds in water overnight. Next day, it turned out like gel. Use this to your pudding. 1. Measure and keep all ingredients ready. Wash the avocados in running water thoroughly. Peel and scoop the avocados. Also Peel and slice the bananas. 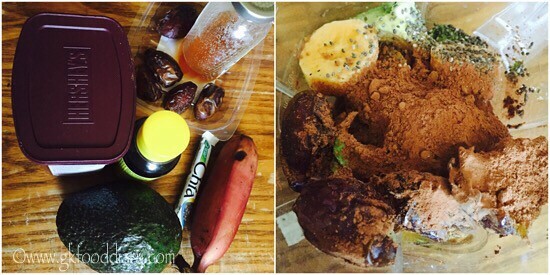 Then take the scooped avocados and sliced bananas into a blender along with other ingredients. 2. Blend everything till smooth. Add the required amount of water as mentioned while grinding. Pour it in serving bowl and refrigerate for at least 30 minutes. 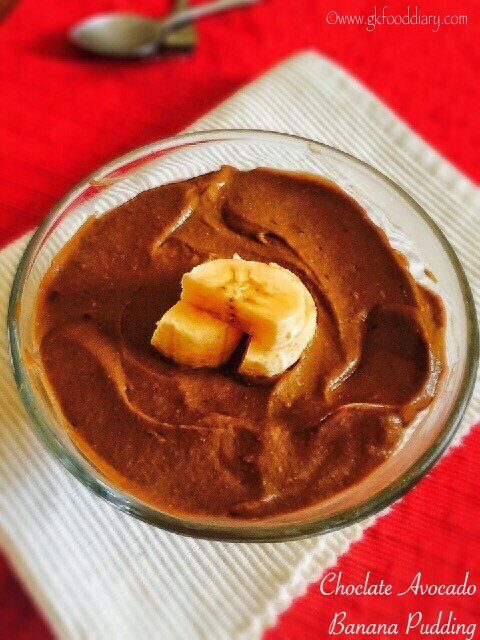 Tasty chocolate avocado pudding is ready! For better results, choose ripe and sweet tasting avocados. Adjust sweetener as per your preference. Always check with your baby’s doctor before giving any new food to your baby. I have added raw chia seeds in the recipe, but soaking is highly recommended for small babies and kids to ensure proper digestion. If you are skipping chia seeds in the recipe, cook the mixture after blending until thick, cool down and then refrigerate. You can serve this pudding with any fruits of your choice.